Detialed mid-19th century map of the Napa Wine Region! Petaluma and Napa Creeks California. This is an uncommon 1861 U.S. Coast Survey nautical chart or map of the Napa River Valley and Petaluma River Valley, California. Essentially two maps on the same sheet, the left hand side of the sheet features a chart of the Petaluma Creek from Petaluma City as it empties into the San Pablo Bay. The chart on the right features the Napa Creek from Napa City to the Bay. Today this region enjoys international regard as the production center of some of the world's finest wines. The southern part of the Napa Creek as it empties into the San Pablo Bay between Mare Island and Vallejo is included in an inset near the bottom border and feature the Mare Island Straits. The straits, which are the mouth of the Napa River, are today popular for recreational boating and water sports. The map offers excellent inland detail to the level of individual buildings, especially in Petaluma City, Napa City and in Vallejo and the Naval Yard. It also notes towns, roads, and inlets. Nautically this map offers a wealth of practical information for the mariner, including countless depth soundings and notes on tides, soundings and undersea dangers. The triangulation for this chart was accomplished by G. A. Fairfield and A. F. Rodgers. The topography is the work of A. F. Rodgers and the hydrography was completed by a party under the command of James Alden. 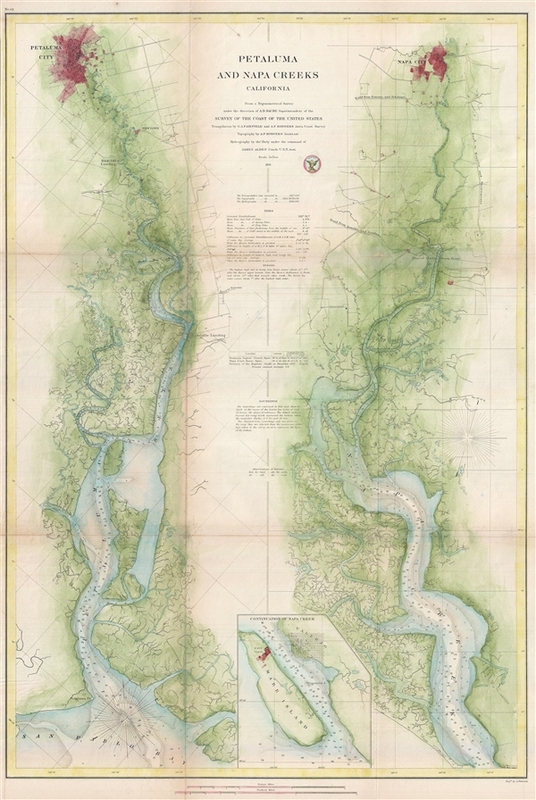 The entire work was produced in 1861 under the direction of A. D. Bache, Superintendent of the Survey of the Coast of the United States and one of the most influential American cartographers of the 19th century. Issued in the 1861 edition of the Superintendent’s Report. Alexander Dallas Bache (July 19, 1806 - February 17, 1867) was an American physicist, scientist and surveyor. Bache is best known in cartographic circles as the Superintendent of the U.S. Coast Survey from 1843 to 1865. Born in Philadelphia, Bache, a great grandson of the statesman and inventor Benjamin Franklin, had a varied career primarily focused on education. He toured Europe on behalf of Girard College and composed an important treatise on European Education. Later he served as president of Philadelphia's Central High School and was a professor of natural history and chemistry at the University of Pennsylvania. On the death of Ferdinand Rudolph Hassler, Bache was appointed Superintendent of the United States Coast Survey. Picking up where Hassler left off Bache presided over the Survey during its most prolific period and oversaw the mapping of most of the United States coastline. To this day his name appears on countless marine pilot books and U.S. Coast Survey nautical charts. For his work he was elected Associate Fellow of the American Academy of Arts and Sciences, a Fellow of the Royal Society of Edinburgh, and a Foreign Member of the Royal Society. Following the Civil War, Bache was elected a 3rd Class Companion of the Military Order of the Loyal Legion of the United States. He died at Newport, Rhode Island and was buried in the Congressional Cemetery in Washington, DC, where he is commemorated with a monument built by American architect Henry Hobson Richardson. Bache, A. D., Report of the Superintendent of the United States Coast Survey, (Washington) 1861. Very good. Backed on archival tissue. Some wear and toning on original fold lines.